I'm in the sixth grade, and I haven't had a magical adventure yet! What's wrong with me? All the other kids in my class have had one. Yesterday for Show-And-Tell, Ryan told us how he met his long-lost uncle, who is a crazy-genius inventor, and they had to stop a group of Evil Florists from stealing his latest invention and taking over the world. Last week, Mary-Elspeth told us how she got pulled into a movie and she had to change the story so it would all come out happy in the end and she could get back home. And that's just this month. Over the last few years, everybody else has done something like that. Some kids have found a doorway into their own Magical Country where they saved all the good talking animals from the bad monsters that were trying to take over. Others learned that they come from a family that can use magic, and have gone off to Wizard Schools, where they have to battle Evil Warlocks who are after them. Jessica found a town of tiny people living in her parents' basement. Susan, Graeme, Duncan and Anna keep solving mysteries that grown-ups can't. Denise found out she was an actual princess. Some kids have prophecies about them, some have to help creatures from other worlds, four have become Secret Agents, and two others have gotten mutant superpowers. Even Haley, who nobody really likes because she wears ugly clothes and braces and never talks to anyone! She just befriended an enchanted ferret, who understands her completely because he can read her mind and he chose her because she's special. It's not fair! I should have a magic ferret! The best thing that ever happened to me was winning second place for my diorama showing how dinosaurs turn into oil. Lame, huh? I hate being the only one who has a totally boring life. So how do I get my own adventure? Have you considered that perhaps your Special Ability is that you're impervious to Adventures? No? I admit, you'd only decide that was "lame," as you so eloquently state. But that's the sentiment of youth. Once you become an adult with Responsibilities and Obligations, you may find you prefer a predictable life without Adventures. If you don't believe me, ask your parents. Be that as it may, you're concerned with how things are now. Allow me to point out (although I'm sure you hate it when grown-ups say this) that you're probably not the only one without a cell phone, designer clothes, brand-name music player or magical adventure. Sure, it feels like all your peers have what you want, but it's not so. The truth is that lots of children just like you need to grow up completely adventure-free, so you can be satisfied with becoming henchmen (sorry, henchpersons), assistants, sidekicks and minions. Many more will just be normal citizens who need rescuing and defending. Somebody has to be Ordinary, otherwise, how would we know who is Special? In any case, you can't make an adventure happen to you. It's like playing the lottery; you could buy a ticket every week for years and years, but if you're not on the Lottery Commission's Secret List, you'll never win. Fortunately, you can prepare yourself to be a winner (for an adventure, anyway). Use your time to learn as much as you can. Don't limit yourself to the obvious disciplines (e.g. martial arts, science, archery, languages, gymnastics and zymurgy), but study anything and everything, even totally useless categories. For example, I know of one student who detected an infiltrating assassin-droid disguised as a dog groomer because she knew that Yuniesky Betancourt played for the Seattle Mariners, not the Tampa Bay Devil Rays (it's a long story). And, of course, you should read this column regularly, so you'll know how to handle all sorts of extraordinary situations. Remember: If you really, really want something with all your heart, so much that it's the first thing you think of when you wake up and the last thing on your mind before falling asleep, and you truly, deeply believe that it's your destiny, then one day, you'll realize it's never going to happen and the subsequent disappointment will be tremendously soul-crushing. You'll do better to keep your expectations low. Seriously. Don't get your hopes up. That way, an adventure would be a Wonderful Surprise, and Life won't be such a let-down when you just end up selling office supplies. 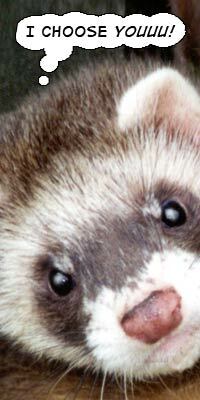 Keep reminding yourself that a ferret -- enchanted or not -- is merely a weasel, and you'll do fine.